We often hear that those affected by Autism think about things differently than others. Maybe it's time more people started thinking differently about Autism. If one in every 88 children in America falls within the Autism spectrum, is it really fair to use words like "special" or "normal" when comparing those who are autistic to those who are not? What is normal anyway? 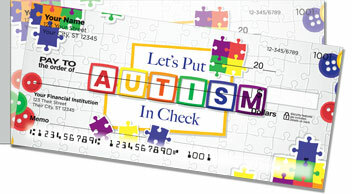 It's true that we do need a better understanding of Autism and its cause. But we also need acceptance. 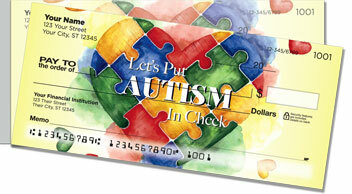 These checks are a small way to keep the conversation going. 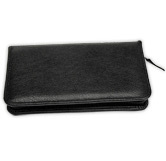 You'll also appreciate the easy-to-use side-tear format, which practically eliminates unwanted rips and wrinkles. 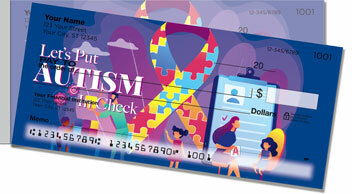 Get your very own Autism Awareness Side Tear Checks today! You can order them with free shipping as well as matching address labels. 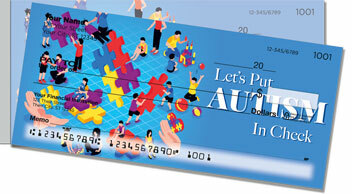 CheckAdvantage proudly donates a portion of proceeds from this design to Autism Speaks.